While they won’t rattle your windows or let you feel the bass in your chest, bluetooth speakers under $50 do leave plenty of room in your budget. Reviews show that the DOSS SoundBox Touch is one of the most feature-packed options available under $50. It sports touch panel controls, 12-watts of power, and balanced sound that wowed reviewers. But, depending on how and where you plan to use your speaker, there are other options that might be a better fit for you. This roundup includes the 5 best bluetooth speakers under $50 that reviewers from around the Internet feel offer exceptional value at some of the lowest prices you’ll find. From the beach to the dorm room, these speakers will take your mobile audio experience up a notch or two without worrying your wallet. 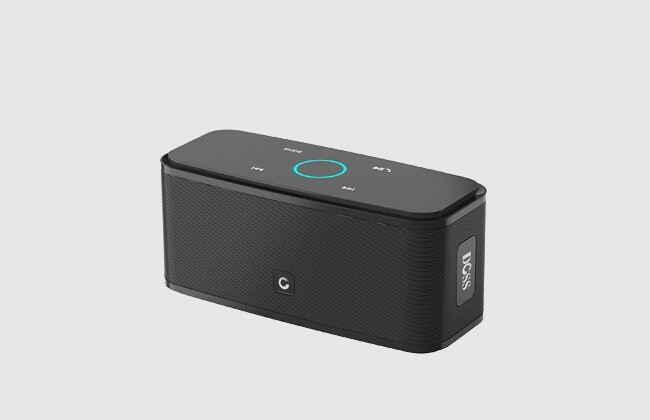 Featuring a sleek, wrap-around design and backlit touch controls on the top, the DOSS SoundBox Touch doesn’t look like a $30 bluetooth speaker. Better still, according to reviewers, it doesn’t sound like one either. It comes with a bounty of inputs, including a 3.5-mm headphone jack and microSD card support if you don’t want to use it wirelessly. Most reviewers also pulled a solid 9 to 10 hours of battery life from a single charge--something you might not find in a speaker two to three times its price. There were a few minor annoyances though. While it’s light enough to take with you on the road or on the patio, there’s no water resistance at all. So keep it away from rain and think twice before heading to the pool. The pick was also a favorite with The Wirecutter and Audiorumble. Wirecutter had previously made it their budget pick in their 2018 “The Best Portable Bluetooth Speaker” roundup. With a sturdy design, generous features, and well-balanced audio, this budget-friendly pick challenged reviewer expectations in the sub-$50 market. The JBL Clip series has remained a top choice for ultra-portable speakers--with its Clip and Clip+ impressing reviewers. With their latest update, the Clip 2 tacks on full IPX7 waterproofing and upgrades the signature clip from plastic to metal. The speaker is rather small--measuring just 3.7-inches in diameter. This round design also makes it more resistant to impacts. Despite the small size, it can crank out a decent amount of volume--though it lacks a bit of bass. For larger areas--or more volume--you can connect multiple speakers together. There’s also an integrated 3.5-mm audio cable for connecting to non-bluetooth devices. Combined with an 8-hour battery life, this waterproof mini speaker is ready for a day at the lake, gym, or pool. This pick ranked highly with both Amazon and The Wirecutter. It’s a current Amazon Choice pick. PC Magazine gave it an Editor’s Choice award. If portability or waterproofing are high on your list, the Clip 2 offers an experience few competitors can match. While this isn’t the most powerful pick on the list, reviewers were thoroughly impressed with the sheer volume this little silicon pod could put out. It’s also splashproof, though there’s no specific certification listed--so watch out for heavy moisture. Reviewers found the strap a trustworthy, sturdy way to attach the speaker to backpacks, belt loops, purse straps, bicycles, and other items for on-the-go listening. Should you need to make or take a quick call, the speaker includes a mic. Unfortunately, reviewers found the quality hit-or-miss. So it won’t replace a standalone speakerphone or better bluetooth speaker. There are a few shortcomings. Obviously, with the small size, it will not fill a room like a larger speaker. The controls are also minimal and don’t provide full control of music or media playback--so you must keep your phone, tablet or laptop nearby to shuffle tracks or the like. 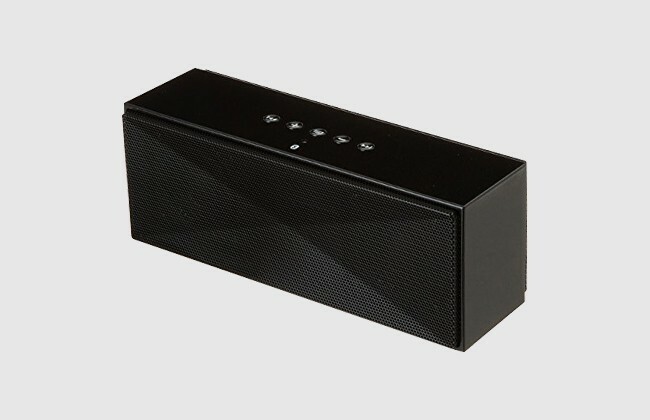 This pick ranked in the Top 5 for Lifehacker’s 2016 “Best Cheap Bluetooth Speakers.” It’s also mentioned as a competitor in The Wirecutter’s 2018 “Best Portable Bluetooth Speakers” rankings. While it’s not for audiophiles, the small footprint and rock-bottom price makes the AmazonBasics Nano a real gem with few competitors. OontZ is known for powerful speakers and fun designs for an affordable price. The Angle 3 is no exception. Its triangle design helps it stand out from other speakers at a similar price. But it also helps to keep the speaker firmly planted when cranking the volume. While it is not waterproof, the IPX5 rating is good enough for splashes during showers or poolside use and the occasional rainstorm should leave the speaker unscathed. It also features rubberized ends that should help prevent damage if the speaker takes a spill. Reviewers pulled 8 hours from a single charge with ease. However, many noted slow charge times. Charge it at night if you plan to use it regularly. It also allows you to quickly swap between paired devices with a quick button press if you want to use it as a speakerphone while watching movies on your tablet or let friends control the music mix at a party. If you like your audio loud and don’t mind sacrificing a bit of battery life, the OontZ Angle 3 is a great pick. In the budget market, many speakers try to stand out with bright colors and bold designs. There’s nothing wrong with that. But sometimes you want something that can sit in the background and not attract attention. While there’s an element of subjectivity to design, we think the AmazonBasics BTV1 offers the best appearance in the sub-$50 market. The controls on the top of the speaker are large enough to hit at a glance but don’t stand out. The power light is a simple LED. The grill has an angular texture to provide a splash of visual appeal. Reviewers seem to agree that this creates a more upscale appearance rarely found in this price range. Of course, it has to perform as a speaker too. Fortunately, the speaker received high marks for audio quality--though the more “natural” sound might not appeal to bass lovers. It also offers roughly 15 hours on a single charge--one of the longest playback times on our list. Other features include speakerphone support and a 3.5-mm headphone jack. The speaker was previously the budget pick for The Wirecutter. While it didn’t make the cut this year, it still received an honorable mention in the competitor listing. Reviewers have plenty of praise for this speaker at its debut price of $60. Now that it’s half the price, there’s even more to love about this premium looking budget bluetooth speaker. The following speakers didn’t make our list but they came close. Still, they offer value in the sub-$50 market and make solid runner-up options if one of the others isn’t in stock or doesn’t interest you. So what makes a good speaker under $50 anyway? Our picks above are what we think are for now the best picks under $50 for most people. We selected these models based on analysis of expert reviews from around the web, user feedback on sites like Amazon, forum comments on our site, social media, and more. While the sub-$50 market has improved dramatically in recent years, we wanted to be sure that every pick on our list offered a decent audio experience. You should be able to crank up the volume and listen to a variety of genres without having to worry about distortion or tinny, empty sound. The whole point of a bluetooth speaker is being able to enjoy your favorite music or media without wires and in better quality than your laptop, phone, or tablet speakers. To do that, you need a battery that’ll last. Most of our picks offer a solid 8 hours of use--some even more! Even at the sub-$50 price point, there’s no excuse for flimsy speakers or cheap materials. Each of our picks offers either a rugged, durable design or a premium aesthetic that fits the investment you’re making in your audio experience. We understand that even the best manufacturer’s sometimes crank out a faulty product. What’s more important is how they handle customer concerns when this happens. We’ve scoured reviews, dug through warranties, and checked customer service forums to be sure that all the companies we list here stand behind their products and do right by their customers. What can you expect from a $50 speaker? Much like the speakers in the under-$100 range, you’ll find great options in the under-$50 category--but there are also quite a few more duds than the higher tiers, so it’s important to check quality before buying. While you’ll find options with full sound, bass is likely a little lacking in most options. At least for punchy, tight hits. Still, most outperform the speakers in your phone, tablet, or laptop. Many $50 speakers feature similar audio quality to the smaller smart speakers on the market. So if using Siri or Google Assistant without your phone sounds appealing, you can probably pick one up for a similar price. This depends on the bluetooth speaker. 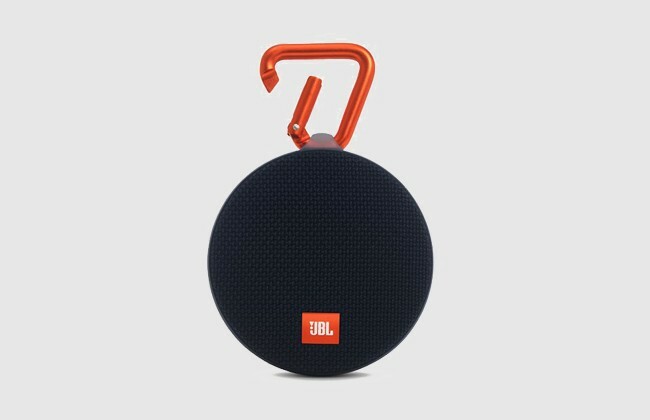 The JBL Clip 2 featured in our picks supports pairing with additional speakers. However, this isn’t a native feature of bluetooth and not often found in the sub-$50 market. Bluetooth speakers and the ability to transmit audio over bluetooth connections have improved by leaps and bounds in the past 3 to 5 years. If you’re skeptical, walk into a major electronics retailer with your smartphone. There’s a good chance the store has display models for their speakers. Pair up your phone and load up your favorite song. You’re probably in for a surprise.